I’ve spoken my piece about why American infrastructure construction is so expensive. This is very much a work-in-progress, but it represents about the extent of my current knowledge on the subject. I want to follow up on this by talking about stereotypes and how they affect what people believe is possible when it comes to construction costs. I wrote about this to some extent here, 4.5 years ago, noting that my impression is that people on the Internet are far more willing to believe that there is efficient construction in Northern Europe than in Southern Europe even though the latter actually has lower construction costs. Here I want to delve somewhat deeper into what stereotypes I’ve seen and how they lead people astray when it comes to infrastructure. It’s a lot more than just Southern and Northern Europe. Each of the following sections describes an aspect of infrastructure planning that doesn’t conform to American stereotypes. Americans are taught from a young age that America is about freedom. They’re taught about the American struggle against British tyranny, about the life-liberty-property triad, and about all manners of national origin stories that get extended to a ridiculous extent. The result is that Americans and even some immigrants who made it big in America and absorbed American ideas readily believe that they are the freest nation in the world in all ways. Faced with the reality that (for example) Germany has far stronger privacy protections, the reaction is either indifference (among most people in the US) or an attempt to castigate privacy as actually a weird imposition (among some tech boosters). The same issue occurs with property rights. Objectively speaking, American law does not have strong protections for property rights. Japan has stronger individual protections in property rights. In addition to strong legal protections, there are strong extralegal protections in countries that have some tolerance of street protests; France is famously such a country, at least if the protesters are white, but Japan had airport riots delaying the construction of Narita and earlier riots blocking the expansion of an American military base. In contrast to these cases, in the US, when the state wants your property, it will get it. Lawsuits can cause delays but not stop a project the state is committed to. Moreover, the state is allowed to time the market. The only thing the government is not allowed to do is excess takings – that is, taking more property than needed to build infrastructure in order to sell it at a profit later. If your property has low value due to past government activity, the government does not need to pay you extra. As mentioned in The Big Roads, the United States built the Interstates through redlined black inner-city neighborhoods because land there was cheaper; after the race riots of the 1960s Washington-area road builders even wanted to build a new round of roads since land would be especially cheap, and they were stopped only by political opposition to such optics rather than by any legal or extralegal challenge. NIMBYism in the US in the context of infrastructure has to be understood as not a reaction to a state that is too weak but to one that is too strong. The denizens of rich suburbs like the sundown town Darien, Connecticut rely on the state to prop up their property values through exclusion, and any change that threatens such exclusion may cause losses that they have no way to recover. Lacking any way to legally prevent the state from slicing through the town to build faster roads and trains, they have to use political influence to prevent infrastructure from being built. I made a post eight years ago scrubbing lists of rail accidents from Wikipedia and comparing the US, the EU, Japan, China, and India. I don’t believe the numbers are true for India or China as not everything may be reported in English sources, although I do believe they’re true for Chinese high-speed rail; but for Japan, the EU, and the US, the numbers are solid. American trains are several times less safe for passengers than European ones, and more than a full order of magnitude less safe than Japanese ones. The US in theory has a culture of safety-first, but in reality it’s more safety theater than safety. Rail signaling is primitive, and automatic train protection (“positive train control,” or PTC) is not required in terminal zones with restricted speed, leading to fatal crashes. The favorite way to deal with danger is to slap an arbitrary speed limit – for example, to permit trains to use a bridge that has just been burned down but at restricted speed, with exactly the result you’d expect. This is difficult for Americans to believe, especially with respect to Asia. I’ve repeatedly seen people insist that Japan does not prioritize safety, and the idea that China does not seems universal in the developed world. Richard Mlynarik’s report of a Caltrain official who, when told Japan turns trains faster than the official thought was possible, responded “Asians don’t value life the way we do,” seems par for the course when it comes to Western attitudes. Westerners are certain that Asians are not fully human but are part machine, with no individuality, perhaps thinking that since Westerners can’t tell East Asians apart East Asians can’t tell one another apart either. The epitome of the American stereotype of dangerous tyrannical efficiency today is China. Ray Lahood, Obama’s first-term secretary of transportation, even mentioned that in connection with high-speed rail. In reality, Chinese infrastructure construction costs do not seem especially low. Not much information makes it to English-language media, and unlike in French or German I don’t know how to look up construction costs in Chinese, but the lines for which I can find data seem to be in line with the global average. Metro Report has an article mentioning two Shanghai Metro extensions: the all-underground Line 9 extension at $225 million per km, and the 46% underground Line 17 at $123 million per km, with very wide stop spacing. Moreover, high-speed rail in China is on the expensive side. There are studies asserting that it isn’t, but they do not control for PPP. The Beijing-Shanghai high-speed line cost 218 million yuan, or about $55 billion adjusted for PPP, making it about $42 million per km, a high figure for a line with almost no tunnels (only 1.2% of the line’s length). The other famously efficient East Asian dictatorship, Singapore, has high infrastructure costs as well, judging by what’s going on with the Thomson MRT Line. Americans fixate on China because it’s so big and because they consider it a rival. But there is no reason to expect the best results to come from a large country. Most countries are small, so we should expect both the most successful and the least successful ones to be small. The actually cheap places to build infrastructure in, like Spain and South Korea, don’t really pattern-match to any American or European self-perception, so it’s much easier to ignore them than to look at Chinese or German efficiency. The United States has a fair amount of political corruption, but it’s not exceptional for this in the developed world. There’s widespread American belief that the public sector is incompetent, and Americans who have compared American and generic first-world public projects correctly think this is especially true of the American public sector, but this is not exactly about corruption. My quip on the subject is that Italy has low construction costs – and Italy’s high corruption levels are no mere stereotype, but are mirrored in Transparency International’s Corruption Perceptions Index. Moreover, low costs and high corruption perceptions seem endemic to Southern Europe and South Korea. I’m not familiar with the precise nature of corruption everywhere. But what I’ve read from Italy and Greece suggests that it’s different from what happens in the United States. In diagnosing Italy’s stagnation over the last generation, Bruno Pellegrino and Luigi Zingales note that Italy has a widespread problem of tax avoidance, leading private companies to mostly hire within extended clans rather than by merit; the reason for the recent stagnation, they posit, is that the computer revolution has made hiring by merit especially important. In Greece the same problem of tax avoidance is endemic – see some links through Wikipedia – and Stathis Kalyvas’s paper about clientelism and political populism notes that Greece does not really have large prestigious private businesses with workers vs. bosses politics the way the US, Japan, South Korea, and the European core do. In Southern Europe, or at least in Greece and Italy, it looks like corruption is endemic to the private sector. The public sector is affected by clientelism, but perhaps infrastructure construction is so removed from politics that there is no unusual corruption there, and thus engineers can innovate their way into lower costs, as postwar Milan did. If the public sector in Italy is as efficient in Germany, it will have lower costs than Germany simply because market wages in Italy are lower thanks to the private sector’s low productivity. This is not a complete story, since it specifically predicts that Italy should have a growing construction cost gap with Germany as their wages diverge, whereas at least based on the smattering of projects I’ve seen Italy was cheaper even in the 1990s and early 2000s, when wages were similar in both countries. Moreover, Scandinavia has low corruption, high wages, and low construction costs. But this is suggestive of how come countries with wages on the margin of the first world tend to consistently have lower construction costs. The nature of American corruption is different. The private sector has little of it. Tax avoidance exists in the US, but not to the same extent as in Italy or Greece. Managerial fraud at big business exists, but is nowhere near the levels of Mediterranean small businesses. Instead, the public sector is inefficient, due to different problems – not quite clientelism, which describes party loyalty as a condition of hiring, but hiring based on personal loyalty to the governor or mayor. What’s more, since the problem goes all the way to the top, expecting the same authoritarian state and municipal officials to successfully privatize infrastructure to unleash private-sector productivity is fruitless. When writing my post about the causes of high American construction costs, I read different takes on the American tradition of adversarial legalism. A paper by Shep Melnick, which I linked in my post, asserts that adversarial legalism is good for various oppressed minorities, focusing on lawsuits forcing better accessibility for people with disabilities, looking at special education as an example. And yet, if we look at the usual liberal standard of fair outcomes rather than fair processes, the outcomes in the United States do not seem especially fair. Workplace discrimination levels against nonwhites range widely between countries as well as between different studies in the same country, but the US seems to be roughly within the European median; there is a large set of references in the OECD’s International Migration Outlook of 2013, PDF-pp. 11-12, as well as a smaller list in the OECD’s The Price of Prejudice, p. 16. The latter source also compares international gender gaps, and the US seems fairly average as well. Only in the employment gap between second-generation immigrants and children of natives does the US do especially well, and that’s in the context of an unusually high-skill mix of immigrants, like similar high performers Canada and Switzerland, neither of which has an especially low discrimination level in equal resume studies. When it comes to Melnick’s question of disability rights, the US is increasingly falling behind thanks to high construction costs. Berlin is about to complete installing elevators at all U-Bahn stations, aided by a process that allows it to make a station accessible for €2 million. Madrid, where this cost is about €5 million per line served by each station, has a large majority of accessible stations already and is looking at full installation next decade. Compare this with the tardiness of New York, where layers of consent decrees and grandfather clauses have created a subway system that is about as old as Berlin’s and only 25% accessible. I literally just saw a comment on Reddit that tried to slot the idea that the US should learn from the rest of the world into political liberalism or Democratic partisanship (“blue tribe”). This is not an idiosyncratic connection. In 2006, at Yearly Kos, a performer used the expression “French-loving” as a self-description for American liberals, and the entire audience said “preach on” in agreement; this and similar epithets hurled by conservatives in the same era may have been a unique artifact of France’s opposition to the Iraq War, but years later Republicans would keep complaining that Democrats want the US to imitate European welfare states. The reality is very different. American indifference to rest-of-world practice is national. So is English Canadian indifference to rest-of-world practice excluding the US and occasionally Britain. If anything, New York is even more solipsistic than the rest of the US. I’ve recurrently seen New Yorkers use the same dismissive language that Americans use for the world outside their country for anything outside the city. In contrast, Bostonians do try to look at how things work in the rest of the US and the same is true of people in Sunbelt cities that build light rail. The upshot of this is that there is not much to look for in intra-American politics. The institutions of American partisanship are not useful for this. Some good ideas can come from people who happen to identify with a party, but the distance between the legal scholars criticizing adversarial legalism and the practice of tort reform, like that between the recommendations of academic environmentalists and the practice of green jobs programs, is vast. Moreover, the elite centrist politics that claims to be above partisanship has to be seen as yet another partisan institution, working hard to limit the scope of debate to what the same elites that have failed to provide good government services will find comfortable. The same can be said for populism. There is nothing to look for on the populist left and right, because as movements they are not concerned with governing, and tend to boost voices that are long on rhetoric and short on knowledge. Alexandria Ocasio-Cortez does not need to be correct for leftists to admire her, for one since the veto points on implementation details are members of Congress well to her right; why should she make an effort to educate herself about fuel taxes or about the white supremacy of the Gilets Jaunes? And the less said about ideological experiments like Walker-era Wisconsin or Brownback-era Kansas, the better. I focus on American stereotypes, and to some extent pan-Western ones, because stereotypes differ by culture. Americans self-perceive as risk-taking and entrepreneurial. Israelis perceive Americans as hopelessly square and rulebound, even in comparison with Europeans. Westerners perceive all East Asians as rulebound and machine-like. Chinese and Malay people self-perceive as dog-eat-dog societies, at least in Southeast Asia, to the point that when I learned Mahatir Mohamed’s criticism of human rights in Asia in university, I learned his take as “we Asians don’t naturally cooperate and require an authoritarian government” rather than as the more typically Western belief that Asians are naturally obedient. The incredulity I’ve encountered when trying to tell Americans how Israelis and Singaporeans perceive things is not just a matter of American solipsism. I’ve seen similar incredulity on this side of the Pond, for example when I told Spanish mathematicians, who are not railfans, that Spain has really low construction costs; they found it hard to believe, due to the widely-shared stereotype of Southern European corruption. By their nature, stereotypes appeal to base instincts, working through unexamined prejudices. Not for nothing, the people most invested in stereotypes, the racists, tend to be the most closed, to the point that openness to experience as a personality trait is almost a proxy for antiracist politics. Neither widely-shared stereotypes (Japanese order, Southern European corruption, etc.) nor more internationally variable ones are enlightening when it comes to actual differences in infrastructure construction costs. The importance of international variability is that Westerners who are closed to the fact that how Asians perceive themselves is different from how Westerners perceive them are likely to be equally closed to a thousand details of governance, business, and engineering between successful and failed infrastructure programs. The most importance difference in stereotypes when it comes to infrastructure is how Americans perceive the difference between Europe and the US and how Europeans perceive it. The US is certain it’s at the top of the world, so if there’s an aspect on which it isn’t, like life expectancy or public transit, then this aspect probably doesn’t matter much and the American entrepreneurial spirit will soon fix it anyway. Few people in the core European countries share this attitude. Americans need to choose between a sense of national pride and improving their infrastructure; for all the glory infrastructure can give, the methods with which they need to build it require letting go of their prejudices against the rest of the world. California Governor Gavin Newsom spoke his piece, and California HSR is most likely dead. His state of the state speech tried to have it both ways, and his chief of staff insisted that no, he had not just canceled the HSR project, but his language suggests he’s not going to invest any more money or political capital in going beyond the Central Valley. Lisa Schweitzer put it best when she talked about his sense of priorities. I actually don’t want to talk about the costs of the project; an article about this topic will appear in the Bay City Beacon any day now, and I will update this post with a link when it does. Rather, I want to talk about alignments. For those of you who’ve been reading me since the start, this means reopening some topics that involved tens of thousands of comments’ worth of flamewars on California HSR Blog. As before, red denotes HSR with top speed of 350 km/h outside the built-up areas of the largest cities, and blue denotes legacy lines with through-service. I ask that people not overinterpret pixel-level alignments. 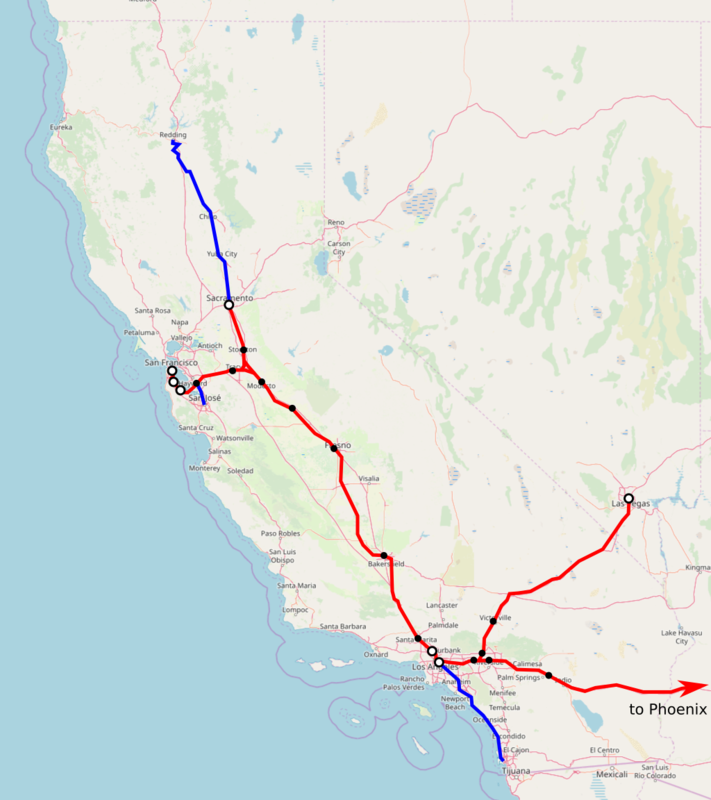 The blue alignment in Southern California is the legacy route taken by Amtrak, the one in the Bay Area is a legacy line from Fremont to San Jose that some area transit advocates want a Caltrain extension on (and if it’s unavailable then it can be deleted with a forced transfer to BART), the one in the far north of the state is the freight line up to Redding. The mid-2000s environmental impact study claims that Los Angeles-San Francisco via Altamont Pass would take 2:36 nonstop. The Tejon route I’m drawing is 12 minutes faster, so in theory this is 2:24. But three express stops in the middle, even in lower-speed territory right near Los Angeles and San Francisco, lead to somewhat longer trip times, as do various design compromises already made to reduce costs. My expectation is that the alignment drawn is about 2:45 on LA-SF and somewhat less on LA-Sacramento, on the order of 2:15 nonstop. There are two ways to get between Los Angeles and Bakersfield. The first is the alignment taken by the I-5, called the Grapevine or Tejon Pass. The second is to detour far to the east via Palmdale and Tehachapi Pass. The alignment I drew is Tejon, that chosen by the HSR Authority is the Tehachapis. Clem Tillier made a presentation about why Tejon is far superior. It is shorter, reducing trip times by about 12 minutes. It is less expensive, since the shorter length of the route as well as the reduced tunneling requirement means fewer civil structures are required; Clem’s presentation cites a figure of $5 billion, but with recent overruns I’ve heard a figure closer to $7 billion. The exact cost of either alignment depends on standards. Unlike Northeastern passenger rail efforts, which are based on bad American design standards that recommend very shallow grades, ideally no more than 1.5-2%, California HSR uses a generic European standard of up to 3.5%, the same as in France. However, 3.5% is a conservative value, designed around TGVs, which almost uniquely in the HSR world have separate power cars. Distributed traction, that is EMUs, has higher initial acceleration and can climb steeper grades. One German HSR line goes up to 4%, and only the EMU ICE 3 train is allowed to use it, not the ICE 1 and 2, which have power cars like the TGVs. Even 5% is achievable far from stations and slow zones, which would reduce tunneling requirements even further. 1. Los Angeles County officials favored the Tehachapi route in order to develop Palmdale around the HSR station. 2. A private real estate company called Tejon Ranch planned to build greenfield development near the Tejon HSR route called Tejon Mountain Village, and opposed HSR construction on its property. As Clem notes, the market capitalization of Tejon Ranch is about an order of magnitude less than the Tehachapi-Tejon cost difference. As for the county’s plans for Palmdale, spending $5 billion on enabling more sprawl in Antelope Valley is probably not the state’s highest priority, even if an HSR station for (optimistically) a few thousand daily travelers in a region of 400,000 exists to greenwash it. Two years ago I wrote an article for the Voice of San Diego recommending electrifying the Los Angeles-San Diego Amtrak line and running trains there faster, doing the trip in about 2 hours, or aspirationally 1:45. Amtrak’s current trip time is 2:48-2:58 depending on time of day. The alignment proposed by the HSR Authority instead detours through the Inland Empire. The good thing about it is that as a greenfield full-speed route it can actually do the trip faster than the legacy coast line could – the plan in the 2000s was to do it in 1:18, an average speed of about 190 km/h, on account of frequent curves limiting trains to about 250 km/h. Unfortunately, greenfield construction would have to be postponed to phase 2 of HSR, after Los Angeles-San Francisco was complete, due to costs. Further design and engineering revealed that the route would have to be almost entirely on viaducts, raising costs. If I remember correctly, the estimated cost of the HSR Authority’s proposed alignment to San Diego was $10 billion in the early 2010s, about $40 million per kilometer (and so far Central Valley costs have been higher). Even excluding the Los Angeles-Riverside segment, which is useful for HSR to Phoenix, this is around $7 billion for cutting half an hour out of trips from Los Angeles and points north to San Diego. Is it worth it? Probably not. What is more interesting is the possibility of using the Inland Empire detour to give San Diego faster trips to Phoenix and Las Vegas. San Diego-Riverside directly would be around 45 minutes, whereas via Los Angeles it would be around 2:20. However, the same question about the half hour’s worth of saving on the high-speed route can equally be asked about connecting San Diego to Las Vegas and Phoenix. These are three not especially large, not especially strong-centered cities. The only really strong center generating intercity travel there is the Las Vegas Strip, and there San Diego is decidedly a second-order origin compared with Los Angeles; the same is even true of San Francisco, which could save about 40 minutes to Las Vegas going via Palmdale and Victorville, or 55 minutes via Mojave and Barstow. Ultimately, the non-arboreal origin of money means that the $7 billion extra cost of connecting Riverside to San Diego is just too high for the travel time benefits it could lead to. There are better uses of $7 billion for improving connectivity to San Diego, including local rail (such as a light rail tunnel between city center and Hillcrest, branching out to Mid-City and Kearny Mesa) and a small amount of extra money on incrementally upgrading the coast line. I’m leaving the most heated issue to last: the route between the Central Valley and the Bay Area. I am not exaggerating when I am saying tens of thousands of comments have been written in flamewars on California HSR Blog over its ten years of existence; my post about political vs. technical activists treated this flamewar as almost a proxy for which side one was on. The route I drew is Altamont Pass. It carries I-580 from Tracy to Livermore, continuing onward to Pleasanton and Fremont. It’s a low pass and trains can go over the pass above-ground, and would only need to tunnel further west in order to reach Fremont and then cross the Bay to Redwood City. Many variations are possible, and the one studied in the mid-2000s was not the optimal one: the technical activist group TRANSDEF, which opposes Pacheco, hired French consultancy SETEC to look at it and found a somewhat cheaper and easier-to-construct Altamont alignment than the official plan. The biggest challenge, tunneling under the Bay between Fremont and Redwood City, is parallel to a recently-built water tunnel in which there were no geotechnical surprises. Second-hand sources told me at the beginning of this decade that such a rail tunnel could be built for $1 billion. Pacheco Pass is far to the south of Altamont. The route over that pass diverges from the Central Valley spine in Chowchilla, just south of Merced, and heads due west toward Gilroy, thence up an alignment parallel to the freight line or US 101 to San Jose. The complexity there is that the pass itself requires tunneling as the terrain there is somewhat more rugged than around Altamont. As far as connecting Los Angeles and San Francisco goes, the two alignments are equivalent. The old environmental impact reports stated a nonstop trip time of 2:36 via Altamont and 2:38 via Pacheco; Pacheco is somewhat more direct but involves somewhat more medium-speed running in suburbia, so it cancels out. The early route compromises, namely the Central Valley route, affected Altamont more than Pacheco, but subsequent compromises in the Bay Area are the opposite; nonetheless, the difference remains small. However, Pacheco is superior for service between Los Angeles and San Jose, where it is about 10 minutes faster, while Altamont is superior for service between the Bay Area and Sacramento, where it is around an hour faster and requires less additional construction to reach Sacramento. As with the Tehachapis, the Authority sandbagged the alignment it did not want. San Jose-based HSR Authority board member Rod Diridon wanted Pacheco for the more direct route to Los Angeles, perhaps realizing that if costs ran over or the promised federal and private funding did not materialize, all three of which would indeed happen, the spur to San Jose was the easiest thing to cut, leaving the city with a BART transfer to Fremont. 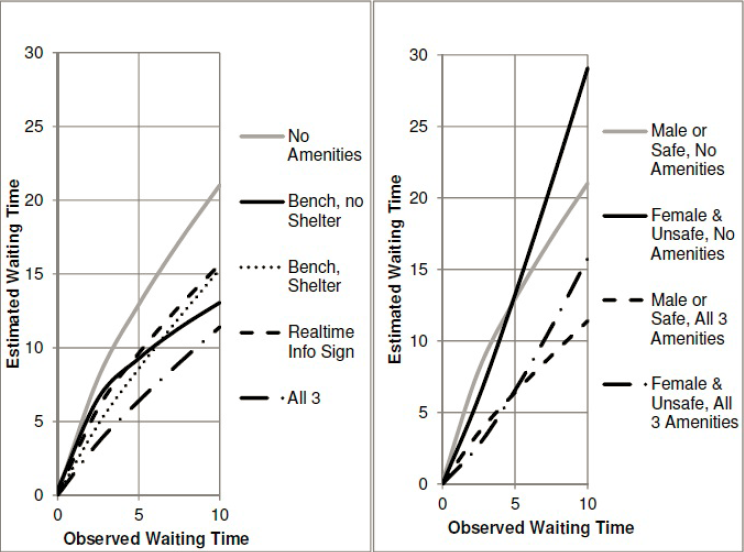 Consequently, the Authority put its finger on the study’s scale: it multiplied the frequency effect on passenger demand by a factor of six, to be able to argue that splitting trains between two Bay Area destinations would reduce ridership; it conducted public hearings in NIMBY suburbs near Altamont but not in ones near Pacheco; and early on it even planned to build San Francisco-San Jose as its first segment, upgrading Caltrain in the meantime. And as with the Tehachapis, the chosen route turned out to be worse than imagined. Subsequent business plans revealed more tunneling was needed. The route through San Jose itself was compromised with curvy viaducts, and the need to blend regional and intercity traffic on the Caltrain route forced further slowdowns in intercity train speed, from a promised 30 minutes between San Francisco and San Jose to about 45. The most recent business plan even gave up on high speed between Gilroy and San Jose and suggested running on the freight mainline in the initial operating stage, at additional cost and time given Union Pacific’s hostility to passenger rail. The HSR Authority has made blunders, perhaps intentionally and perhaps not, that complicate any future project attempting to rescue the idea of HSR. In both Los Angeles and the Bay Area, delicate timetabling is needed to blend regional and intercity rail. Heavy freight traffic interferes with this scheduling, especially as Union Pacific demands unelectrified track, generous freight slots, and gentle grades for its weak diesel locomotives, frustrating any attempt to build grade-separations cheaply by using 3-4% grades. Caltrain’s trackage rights agreement with UP contained a guillotine clause permitting it to kick freight off the line if it changed in favor of an incompatible use, originally intended to permit BART to take over the tracks; Caltrain gave up this right. UP is not making a profit on the line, where it runs a handful of freight trains per day, but the industrial users insisted on freight rail service. Likewise, the Central Valley segment has some route compromises baked in, although these merely raise costs rather than introducing forced slowdowns or scheduling complications. A future project between Merced, the northern limit of current construction, and Sacramento, could just spend more time early on negotiating land acquisitions with the farmers. It is in a way fortunate that in its incompetence, the HSR Authority left the most important rail link in the state – Los Angeles-Bakersfield – for last. With no construction on the Tehachapi route, the state will be free to build Tejon in the future. It will probably need to buy out Tejon Mountain Village or add some more tunneling, but the cost will still be low compared with that of the Palmdale detour. Ultimately, the benefits of HSR increase over time as cities increase in size, economic activity, and economic connectivity. The Shinkansen express trains ran hourly in 1965; today, they run six times per hour off-peak and ten at the peak. Going back even earlier, passenger traffic on the London Underground at the beginning of the 20th century was not impressive by today’s standards. The fact that national rail traffic plummeted in most developed countries due to the arrival of mass motorization should not distract from the fact that overall travel volumes are up with economic growth, and thus, in a growing area, the case for intercity rail investment steadily strengthens over time. Chickenshit governors like Newsom, Andrew Cuomo, and Charlie Baker are not an immutable fact of life. They are replaced after a few terms, and from time to time they are replaced by more proactive leaders, ones who prefer managing big-ticket public projects successfully to canceling them or scaling them back on the grounds that they are not competent enough to see them through. I am wrapping up a project to look at speedup possibilities for trains between New York and New Haven; I’ll post a full account soon, but the headline result is that express trains can get between Grand Central and New Haven in a little more than an hour on legacy track. In this calculation I looked at speed zones imposed by the curves on the line. The biggest possible speedups involve speed limits that are not geometric – and those in turn come from some very sharp slow zones. The worst is the Grand Central station throat, and I want to discuss that in particular since fixing the slowest zones usually yields the most benefits for train travel times. Following Richard Mlynarik’s attempt to rescue the Downtown Extension in San Francisco, I’ve assumed that trains can approach terminals at 70 km/h, based on German standards. At this speed, an EMU on level track can stop in about 150 meters. In Paris, the excellent Carto Metro site details speed limits, and at most terminals with bumper tracks the speed limit is 60 km/h, with a few going up to 100 km/h. Even with bumper tracks, 70 km/h can be supported, provided the train is not intended to stop right at the bumpers. At a fixed speed, the deceleration distance is the inverse of the deceleration rate. There is some variation in braking performance, but it’s in a fairly narrow range; on subway trains in New York, everything is supposed to brake at the same nominal rate of 3 mph/s, or 1.3 m/s^2, and when trains brake more slowly it’s because of a deliberate decision to avoid wearing the brakes out. As long as the train stops 1-2 car lengths away from the bumpers, as is routine on Metro-North, the variation will be much smaller than the margin of safety. Fast movement through the station throat is critical for several reasons. First, as I’ll explain below, sharp speed limits have an outsize effect on trip times, and can be fixed without expensive curve easements or top-rate rolling stock. And second, at train stations with a limited number of tracks, the station throat is the real limiting factor to capacity, since trains would be moving in and out frequently, and if they move too slowly, they’ll conflict. With its 60 km/h throat, Saint-Lazare on the RER E turns 16 trains per hour at the peak on only four tracks. I had a conversation with other members of TransitMatters in Boston yesterday, in which we discussed work to be done for our regional rail project. One of the other members, I forget who, asked me, do European train protection systems shut down in station throats too? The answer to the question is so obviously yes that I wanted to understand why anyone would ask it. Apparently, the American mandate for automatic train protection on all passenger rail lines, under the name positive train control, or PTC, is only at speeds higher than 10 miles per hour. At 10 mph or less train operators can drive the train by sight, and no signaling is required, which is why occasionally trains overrun the bumpers even on PTC-equipped lines if the driver has sleep apnea. Without video, nobody could see the facial expressions I was making. I believe my exact words were “…What? No! What? What the hell?”. The conversation was about South Station, but the same situation occurs at Grand Central. Right-of-way geometry is good for decent station approach speed – there is practically no limit at Grand Central except tunnel clearances, which should be good for 100 km/h, and at South Station the sharp curve into the station from the west is still good for around 70 km/h given enough superelevation. Last year, I published code for figuring out acceleration penalties based on prescribed train characteristics. The relevant parameters for Metro-North’s M8 is initial acceleration = 0.9 m/s^2, power/weight = 12 kW/t. Both of these figures are about two-thirds as high as what modern European EMUs are capable of, but it turns out that at low speed it does not matter too much. Right now the Grand Central throat has a 10 mph speed limit starting just north of 59th Street, just south of milepoint 1. The total travel time over this stretch is 6 minutes, a familiar slog to every regular Metro-North rider; overall, the schedule between Grand Central and Harlem-125th Street is 10 minutes northbound and 12-13 minutes southbound, the difference coming from schedule padding. The remaining 65 or so blocks are taken at 60 mph, nearly 100 km/h, and take around 4 minutes. Now, let’s eliminate the slow zone. Let trains keep cruising at 100 km/h until they hit the closer-in parts of the throat, say the last kilometer, where the interlocking grows in complexity and upgrading the switches may be difficult; in the last kilometer, let trains run at 70 km/h. The total travel time in the last mile now shrinks to a minute, and the total travel time between Grand Central and Harlem shrinks to 5 minutes and change. Passengers have gained 5 minutes based on literally the last mile. For the same reason, the Baltimore and Potomac Tunnel imposes a serious speed limit – currently 30 mph through the tunnel, lasting about 2 miles; removing this limit would cut 2-2.5 minutes from the trip time, less than Grand Central’s 5 because the speed limit isn’t as wretched. The total travel time between New York and New Haven on Metro-North today is about 1:50 off-peak, on trains making all stops north of Stamford. My proposed schedule has trains making the same stops plus New Rochelle doing the trip in 1:23. Out of the 27-28 minutes saved, 5 come from the Grand Central throat, the others coming from higher speed limits on the rest of the route as well as reduced schedule padding; lifting the blanket 75 mph speed limit in Connecticut is only worth about 3 minutes on a train making all stops north of Stamford, and even on an express train it’s only worth about 6 minutes over a 73 kilometer stretch. High-speed rail programs like to boast about their top speeds. But in reality, the difference between a vanilla 300 km/h train and a top of the line 360 km/h only adds up to a minute every 30 kilometers, exclusive of acceleration time. Increasing top speed is still worth it on lines with long stretches of full-speed travel, such as the Tohoku Shinkansen, where there are plans to run trains at 360 over hundreds of kilometers once the connection to Hokkaido reaches Sapporo. However, ultimately, all this extra spending on electricity and noise abatement only yields a second-order improvement to trip times. In contrast, the slow segments offer tremendous opportunity if they are fixed. The 10 mph limit in the immediate Penn Station throat slows trains down by around 2 minutes, and those of Grand Central and South Station slow trains by more. A 130 km/h slog through suburbia where 200 km/h is possible costs a minute for every 6.2 km, which easily adds up to 5 minutes in a large city region like Tokyo. An individual switch that imposes an undue speed limit can meaningfully slow the schedule, which is why the HSR networks of the world invented high-speed turnouts. Richard Mlynarik notes that in Germany, the fastest single end-to-end intercity rail line used to be Berlin-Hamburg, a legacy line limited to 230 km/h, where trains averaged about 190 km/h when Berlin Hauptbahnhof opened (they’ve since been slowed and now average 160). Trains go at full speed for the entire way between Berlin and Hamburg, whereas slow urban approaches reduce the average speed of nominally 300 km/h Frankfurt-Cologne to about 180, and numerous compromises reduce that of the nominally 300 km/h Berlin-Munich line to 160; even today, trains from Berlin to Hamburg are a hair faster than trains to Munich because the Berlin-Hamburg line’s speed is more consistent. The same logic applies to all travel, and not just high-speed rail. The most important part of a regional railway to speed up is the slowest station throats, followed by slow urban approaches if they prove to be a problem. The most important part of a subway to speed up is individual slow zones at stations or sharp curves that are not properly superelevated. The most important part of a bus trip to speed up is the most congested city center segment. All reform agendas run into the same problem: someone needs to implement the reform, and this someone needs to be more politically powerful than the entrenched interests that need reform. The big political incentive for a leader is to swoop in to fix an organization that is broken and get accolades for finally making government work. But whether this work depends on what exactly is broken. If the fish rots from the tail, and better management can fix things, then reformist politicians have an easy time. The problem is that if the fish rots from the head – that is, if the problem is the political leaders themselves – then there is no higher manager that can remove underperforming workers. My contention is that when it comes to poor American public transit practices, the fish usually rots from the head. I wrote my first comment documenting high New York construction costs at the end of 2009. By 2011 this turned into my first post in my series here with some extra numbers. By the time I jumped from commenting to blogging, the MTA had already made a reference to its high costs in a 2010 report called Making Every Dollar Count (p. 11): “tunneling for the expansion projects has cost between three and six times as much as similar projects in Germany, France and Italy.” New York City Comptroller Scott Stringer has been plagiarizing my 2011 post since 2013. However, the early recognition has not led to any concrete action. There has not been any attention even from leaders who could gain a lot of political capital from being seen as fixing the problem, such as governors in California, New York, and Massachusetts, as well as successive New York mayors. That Governor Cuomo himself has paid little attention to the subway can be explained in terms of his unique personal background from a car-oriented city neighborhood, but when it’s multiple governors and mayors, it’s most likely a more systemic issue. What’s more, there has been plenty of time to come up with an actionable agenda, and to see it pay dividends to help catapult the career of whichever politician can take credit. The MTA report came out 9 years ago. An ambitious, forward-thinking politician could have investigated the issue and come up with ways to reduce costs in this timeframe – and in the region alone, four politicians in the relevant timeframe (Mayors Bloomberg and de Blasio, Cuomo, and Governor Christie) had obvious presidential ambitions. Evidently, there has been action whenever a political priority was threatened. The LIRR had long opposed Metro-North’s Penn Station Access project, on the grounds that by sending trains through a tunnel used by the LIRR, Metro-North would impinge on its turf. As it was a visible project and a priority for Cuomo, Cuomo had to remove the LIRR’s obstruction, and thus fired LIRR President Helena Williams in 2014. So what’s notable is that construction costs did not become a similar political priority, even though rhetoric of government effectiveness and fighting waste is ubiquitous on the center-left, center, and center-right. That successive powerful American leaders have neglected to take on construction costs suggests that there is no benefit to them in fixing the problem. The question is, who benefits from high costs, then? The answer cannot be that these politicians are all corrupt. The inefficiency in construction does not go to any serious politician’s pockets. Corruption might, but that requires me to believe that all relevant mayors and governors take bribes, which I wouldn’t believe of Italy, let alone the United States. One or two crooks could plausibly lead to cost explosion in one place, but it is not plausible that every serious politician in the New York area in the last decade has been both corrupt and in on the exact same grift. Another answer I’d like to exclude is powerful interest groups. For example, if the main cause of high American construction costs were unions, then this would explain why governors all over the more liberal states don’t make an effort to build infrastructure more cheaply. However, there are enough high-cost states with right-wing politics and anti-union laws. The other entrenched interest groups are quite weak nationwide, for example planners, who politicians of all flavors love to deride as unelected bureaucrats. In my dealings with New York, I’ve noticed a pattern: the individual planners I talk to are curious, informed, and very sharp, and I don’t just mean the ones who leak confidential information to me. This does not stop at the lower levels: while most of my dealings with planners were with people who are my age or not much older, one of my sources speaks highly of their supervisor, and moreover my interactions with senior planners at the MTA when Eric Goldwyn and I pitched our bus redesign were positive. Eric also reports very good interactions with bus drivers and union officials. In contrast, the communications staff is obstructive and dishonest. Moreover, the most senior layer of management is simply incompetent. Adam Rahbee describes it as “the higher up you get, the less reasonable people are” (my paraphrase, not a direct quote); he brings up work he proposed to do on reworking on the subway schedules, but the head of subway operations did not have the budget to hire an outside consultant and the higher-up managers did not even know that there was a problem with trains running slower than scheduled (“running time”). A number of area observers have also noticed how MTA head Ronnie Hakim, a Cuomo appointee, was responsible to much of the recent spate of subway slowdowns. Hakim, with background in law rather than operations, insisted speed should not be a priority according to Dan Rivoli’s sources. The operations staff seem to hate her, judging by the number and breadth of anonymous sources naming her as one of several managers who are responsible for the problem. The pattern is, then, that the put-upon public workers who run the trains day in, day out are fine. It’s the political appointees who are the problem. I don’t have nearly so many sources at other transit agencies, but what I have seen there, at least in Boston and San Francisco, is consistent with the same pattern. Quite often, governors who aim to control cost institute general hiring freezes, via managers brought in from the outside, even if some crucial departments are understaffed. For example, Boston has an epidemic of bus bunching, is staffed with only 5-8 dispatchers at a given time, and can’t go up to the necessary 15 or so because of a hiring freeze. The 40 or so full-time dispatchers who are needed to make up the difference cost much less than the overtime for bus drivers coming from the bunching, to say nothing of the extra revenue the MBTA could get if, with the same resources, its buses ran more punctually. In the name of prudence and saving money, the MBTA wastes it. The above section has two examples of political interference making operations worse: a hiring freeze at the MBTA (and also at the MTA), and Ronnie Hakim deemphasizing train speed out of fear of lawsuits. There is a third example, concerning capital planning: Cuomo’s interference with the L shutdown, well covered by local sources like Second Avenue Sagas, in which the governor effectively took sides in an internal dispute against majority opinion just because engineering professors in the minority had his ear. All three examples have a common thread: the negative political interference is in a more risk-averse direction – hiring fewer people, running slower trains, performing ongoing maintenance with kludges rather than a long-term shutdown. The importance of risk-aversion is that some of the problems concerning American construction costs are about exactly that. Instead of forcing agencies that fight turf battles to make nice, political leaders build gratuitous extra infrastructure to keep them on separate turf, for example in California for high-speed rail. Only when these turf battles risk a visible project, such as the LIRR’s opposition to Penn Station Access, do the politicians act. Costs are not so visible, so politicians let them keep piling, using slush funds and raiding the rest of the budget. In New York, the mined stations, too, are a problem of risk-aversion. Instead of opening up portions of Second Avenue for 18 months and putting it platforms, the MTA preferred to mine stations from a smaller dig, a five-year project that caused less street disruption over a longer period of time. An open dig would invite open political opposition from within the neighborhood; dragging it over five years may have caused even more disruption, but it was less obtrusive. The result: while the tunneling for Second Avenue Subway was about twice as expensive as in Paris, the stations were each seven times as expensive. The overall multiplier is a factor of seven because overheads were 11 times as expensive, and because the stop spacing on Second Avenue is a bit narrower than on the Paris Metro extension I’m comparing it with. In contrast with the current situation in New York, what I keep proposing is politically risky. It involves expanding public hiring, not on a massive level, but on a level noticeable enough that if one worker underperforms, it could turn into a minor political scandal in which people complain about big government. It involves promoting smart insiders as well as hiring smart outsiders – and those outsiders should have industry experience, like Andy Byford at New York City Transit today, not political experience, like the MBTA’s Luis Ramirez or the FRA’s Sarah Feinberg; by itself, hiring such people is not risky, but giving them more latitude to operate is, as Cuomo discovered when Byford began proposing his own agenda for subway investment. On the engineering level, it involves more obtrusive construction: tunnels and els, not bus lanes that are compromised to death – and the tunnels may involve cut-and-cover at stations to save money. Regional rail is obtrusive politically, as modernization probably requires removal of many long-time managers who are used to the current way of doing things (in Toronto, the engineers at GO Transit obstructed the RER program, which was imposed from Metrolinx), and in New York the elimination of Long Island and the northern suburbs’ respective feudal ownership of the LIRR and Metro-North. The end result saves money, but little kings of hills will object and even though American states have the power to overrule them, they don’t want the controversy. American transportation infrastructure does not work, and is getting worse. The costs of building more of it are extremely high, and seem to increase with every construction cycle. Operating costs for public transit run the gamut, but in the most important transit city, New York, they are the highest among large world cities, and moreover, the cheapest option for extending high-quality public transit to the suburbs, regional rail, is not pursued except in Silicon Valley and even there it’s a half-measure. The problems are political. Heavyweight politicians could use their power to force positive reforms, but in a number of states where they’ve been able to do so on favorable terms, they’ve done no such thing. On the contrary, political influence has been negative, installing incompetent or dishonest managers and refusing to deal with serious long-term problems with operations and maintenance. The reason politicians are obstructive is not that there’s no gain in improving the state of public services. On the contrary, there is a huge potential upside to getting credit for eliminating waste, fraud, and abuse and delivering government projects for much cheaper than was thought possible. But they look at minor controversies that could come from bypassing local power brokers, who as a rule have a fraction of the influence of a governor or big city mayor, or from building bigger projects than the minimum necessary to be able to put their names or something, and stop there. One animal analogy for this is that the fish rots from the head: the worst abuses come from the top, where politicians prefer slow degradation of public services to a big change that is likely to succeed but risks embarrassment or scandal. The other animal analogy is that, through a system that rewards people who talk big and act small, American politics creates a series of chickenshit leaders. One of my go-to datasets for analyzing American intercity traffic is the Consumer Airfare Report. It reports on average airfares paid for domestic airline traffic, and on the way gives exact counts for O&D traffic between any pair of cities in the contiguous United States. Six and a half years ago I used this dataset to look at potential demand for high-speed rail, back when high-speed rail was still a topic of conversation in American politics, and a few days ago I got curious and looked again. Unfortunately, the Consumer Airfare Report is no longer available as an easily downloadable table, due to web design horror. The relevant table, Table 6, used to be downloadable per quarter; today the only version lumps all data going back to 1996 and is 100 MB. Here are two cleaned up versions in .ods format, one a 40 MB table going back to 1996 and one an 800 KB table of just the most recent quarter available, the second quarter of 2018. The files lump all airports in a metro area together, such as JFK and Newark, and reports data in ridership per day; be aware that in the smaller file I repeat every city pair, one for each direction, making it easy to sort by city to figure out each city’s total air traffic, which means that just summing up ridership for all city pairs together yields double the actual traffic. In this post I’m going to compare data from 2018 to data from 2011, the year used in my previous post. The proposition of high-speed rail is that it can replace short-haul flights. A plane averages about 1,000 km/h but incurs considerable taxi, takeoff, and landing time, and passengers also have considerable airport access and egress times, including security and other queues. High-speed trains average about 200-250 km/h, but need no security – a well-run system allows passengers to show up at the station less than five minutes before the train departs – and have much shorter access and egress times as stations are located near city centers. The above table shows a small increase in average distance flown, about 2% since 2011. However, this masks patterns in the largest cities. New York-Los Angeles traffic grew 30%, compared with 23% in national traffic growth; it is now barely behind New York-Miami (with West Palm Beach separated out) for third busiest American air city pair, the first being far and away Los Angeles-San Francisco. We can look at the change in the proportion of traffic that can be served by HSR in the largest six American air markets since 2011; consult my post from 2012 for the exact definitions of which corridors count within which buckets – there are some revisions and fixed to be made, but I’ve not done them in order to keep the list of city pairs constant. Las Vegas is no longer ahead of Boston, and Dallas is a fraction of a percent below Boston as of 2018. In the East, short-distance markets have shrunk, in relative terms. Observe that in Chicago the entire difference is within the 3-hour radius, including the spokes of any Midwest HSR network, where air travel has srhunk 12.6% in absolute terms, whereas the 3-to-5-hour annulus, including farther away cities like Atlanta and New York, has not only grown but kept up with Chicago’s overall domestic air travel volumes. But in New York, Washington, and Boston, both the 3-hour radius and the 3-to-5-hour annulus have shrunk, reflecting flights to intermediate Midwestern cities east of Chicago as well as to the South; Boston’s 3-to-5-hour annulus has shrunk 6% in absolute terms. Since 2011 there has been an increase in air travel to California, especially San Francisco. Los Angeles-San Francisco, once the second largest air market in the US behind New York-Miami, is now far ahead of it, and on its strength, the share of air travel out of Los Angeles and San Francisco that’s within HSR radius has held up. California’s HSR problems are not about whether there’s demand for such infrastructure. There clearly is. The problems are exclusively about construction costs. But as the state’s economy grows, demand for internal travel is increasing, making HSR a better proposition. What does this mean for HSR? The cynical answer is nothing, because in an America where even high-spending Green New Deal proposals neglect HSR and focus on electric cars, it’s unlikely there will be a political effort to build anything. Even Amtrak seems content with justifying capital expense on grounds of climate adaptation rather than reducing trip times. That said, in the event of a concerted national effort to build HSR, the changes in travel patterns this decade suggest some changes on the margins. California and Texas grow in value while the Midwest falls in value. There is asymmetry in this situation in that there aren’t a lot of peripheral lines in California and Texas that are becoming interesting now that these states’ economies are bigger than they were when rail advocates first came up with maps in the late 2000s. There is still far too little traffic to justify stringing HSR from Las Vegas to Salt Lake City or from Sacramento to Portland under the mountains. In Texas, there has been a shift from the T-bone alignment to a more triangle-shaped network, since a direct Dallas-Houston line is already under construction, but beyond the Texas triangle, tails like Dallas-Oklahoma City and Houston-New Orleans aren’t getting stronger – Houston-New Orleans air travel volumes are actually down from 2011, though Dallas-New Orleans volumes are up. The core lines, of course, don’t change. The Northeast Corridor is still the most important corridor, the next most important are still tie-ins extending it to the south and west, and the following is still California HSR. But the dreams of a nationally connected network, or at least a connected network in the eastern two-thirds of the US, should be cast aside – the in-between links, always peripheral, have weakened in this decade.